I love the taste of Mediterranean vegetables. Their rich, bright colours and delicious, fresh flavour just personify summer. At least once a week, I roast a big pan full of multi-colored peppers, zucchini and red onions. It is such an easy thing to do, and yet it is the foundation for countless meals and snacks. Cooled and refrigerated, roast vegetables will keep for at least three days and they are the most natural, healthy fast food I know. This is more a guide than a recipe, as the quantities and ingredients are very flexible. It is well worth making plenty as you can do so much with the leftovers. I tend to use more peppers than zucchini because I like peppers more (although I rarely leave out the zucchini as it brings a great touch of green, along with good flavour to the dish). I like to use red onions for their colour and flavour, but if you only have white or yellow onions there is no reason not to use them. 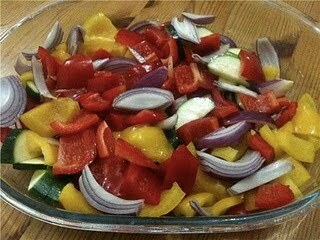 To make a large pan of Roast Mediterranean Vegetables I would use two red onions, two red peppers, one yellow pepper, one orange pepper and two small to medium zucchini. Of course if you can’t get multi-colored peppers, you can use different quantities of different colours. I do avoid green peppers though as they tend to be very bitter in England where I live – but if you can get lovely sweet North American bell peppers, feel free to use those too. If you like garlic, peel a few cloves to taste – I would use five or six in a big pan - and toss them in with the vegetables. They will roast to a soft, creamy deliciousness, adding flavour to every vegetable they touch. All you do is de-seed and cut the peppers into chunks (about an inch square, but don’t panic, no one is going to check the sizes! ), slice each zucchini in half lengthwise and then chop the halves into half inch thick half moons, and peel the onions and cut them in about eight pieces each. Basically I cut each onion in half and then cut each half in quarters. Put all the vegetables in a large roasting pan. Now mix two tablespoons of olive oil and 1 tablespoon of Balsamic Vinegar together. You can use whichever sort of olive oil you prefer. If you like a strong flavour, go for Extra Virgin Olive Oil, but if you prefer a milder flavour, use ordinary olive oil. It is worth buying good Balsamic vinegar as there really is a difference in flavour. You don’t have to buy the really expensive stuff if it is cost prohibitive, but I would urge you to choose a mid-price, properly aged version. Now pour the oil and vinegar over the vegetables, tossing them with your hands to coat. You want the vegetables to be shiny with the mixture, but not dripping. If you do not feel they are coated well enough, feel free to add a bit more oil, or mix up a bit more oil and vinegar if you like. Go easy though; you don’t want them to be greasy. If you want to toss in some dried Italian herbs at this point (about one teaspoon of thyme, oregano or basil, or a mixture of the three), this makes a very tasty addition. Spread the vegetables out over the pan as evenly as you can. In terms of oven temperature, I don’t think it has to be screaming hot to roast vegetables. (Potatoes, yes - vegetables, no.) I preheat my oven to about 200℃ and then turn it back to 180℃ when I put the vegetables in. (That’s about 400℉ for preheating, and 375℉ when you put the vegetables in.) With the amount of vegetables I have described, you can count on about thirty to forty minutes roasting time, but you do need to keep an eye on them. I stir them round at least once during the cooking time , usually about half way through. You want them to be just beginning to brown up on the edges, but you definitely do not want them burned. If you want to make extra-special roast vegetables, toss some pieces of asparagus in with the vegetables twenty minutes before the end of the cooking time or add some sugar snap or snow peas ten minutes before the end of cooking time. When the vegetables have cooked, remove them from the oven. Make up couscous according to package directions. I recommend adding a vegetable stock cube to the water that you use to make the couscous for flavour. Now toss the couscous with some of the roast vegetables and a drizzle of olive oil. Adding some pine nuts and chopped fresh basil gives the dish an Italian flavour. You can either serve this dish hot, or allow to cool, pop in the fridge and use as a cold salad. Stir the vegetables into cooked rice along with a bit of butter and salt and pepper to taste. Cook some pasta according to package directions and add the vegetables along with tomato or pesto sauce. Layer the roast vegetables with ready-to-cook lasagna sheets, tomato sauce, béchamel or cheese sauce and grated vegetarian mozzarella cheese to make lasagne. Bake for forty minutes at 170℃ or 350℉ until the top is golden brown. Slice a piece of French bread almost in half, and fill with roast vegetables and your favourite veggie cheese. Wrap the sandwich in aluminum foil and pop in the oven for about ten to fifteen minutes on medium heat to warm through. Stuff toasted pita bread with hummus and cold roasted vegetables. Place warm roasted vegetables on a plate and top with a poached or fried egg (or two). You can use roasted vegetables as a filling for omelettes. Make fajitas by tossing the roasted vegetables in some Mexican seasoning (you can buy packets in the grocery store), and wrapping them in warmed tortillas. Top with guacamole, grated vegetarian cheese, salsa and/or sour cream to taste. If you prefer your fajitas mild (as my family do) just take it easy on the seasoning, or leave it out altogether. Roast vegetables can also be used in enchiladas, burritos and quesadillas. For a quick and easy eggplant-free ratatouille, warm a tin or two of drained chopped tomatoes (reserve the juice) in a saucepan and add some of the roasted vegetables. Cook together until warmed through, adding a bit of the reserved liquid if you feel it needs it. Making a big pan (or two!) 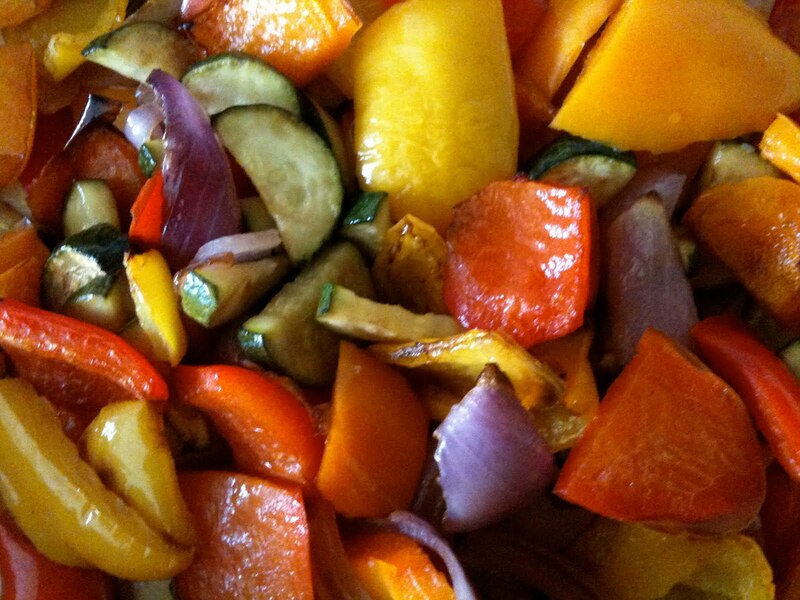 of roasted vegetables can be your ticket to several days of delicious, nutritious and easy meals. These ideas are only a beginning. Served hot or cold, Roasted Mediterranean Vegetables are an easy, nutritious and delicious way to serve your family a variety of healthy vegetarian meals. Linking up with Meatless Monday and My Meatless Monday. Oooh, this looks great! I'm really into mediterranean flavors lately and I don't eat red meat, so this is perfect for me! Thanks!